Australia’s top influencers have been recognised at the 2017 Australia’s Top 50 Influencer Awards with YouTube’s How Ridiculous channel taking out first place. The awards presented by online retailer MyDeal.com.au were given to the top 50 most prominent social media influencers including Angry Dad and Not So Mumsy. Buzzfeed Australia, Cosmopolitan and Business Insider all participated in the judging process. 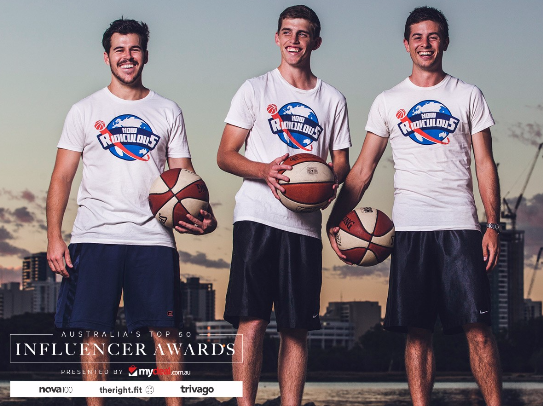 The three boys behind the Youtube channel – Brett Stanford, Scott Gaunson and Derek Herron – started their fame with a recording breaking basketball shot in Switzerland, and now have over 500,000 subscribers and over 74 million Youtube views. 1st: How Ridiculous by Brett, Scott and Derek- A trio of guys who travel the world breaking records, saving lives and being viral sensations. 2nd: They Get Around by Steve and Lexi – Spine-tingling photographers who travel the world,capturing every jaw-dropping moment. 3rd: Not So Mumsy by Marcia Leone – A style conscious and media-savvy mama who loves to keep motherhood an adventure. 4th: Miss Gunner by Ashley Schuberg – A stunning fashion, lifestyle and travel blogger with an overloading collection of shoes, effortless style and amazing business sense. 5th: Chloe Ting by Chloe Ting – A fashion, lifestyle and travel blogger who turned her passion into a career, filling her blog with stunning photos and content. 6th: Li-Chi Pan by Li-Chi Pan – An aesthetically pleasing blog full of delicious food, stunning city views and enviable sights. 7th: The Trend Spotter by Dasha and Colin – The place to go for all men’s and women’s fashion news from across Australia and the globe. 8th: Diary of Jake by Jake Bley – A lively and entertaining LGBTQI YouTuber, who shares his life experiences online, inspiring thousands. 9th: Melbourne Girl by Emily Collie – A blogger who shares the best and most stylish places to visit in Melbourne, whether it be food, fashion or art. 10th: Angry Dad by Mitchell and Dylan – Mitchell Orval and his brother Dylan Orval who comedically torment their poor father and upload it online, with over 21 million YouTube views and one of Australia’s largest online following.